Never heard of pineapple butter buns? You are in for a treat. It's wonderful, soft rolls with a brown sugar and pineapple glaze on the bottom of the pan (like pineapple upside down cake). The rolls also have a sweet pineapple filling. For the rolls, add yeast and sugar in the warm water and proof for 20 minutes. Scald milk and cool to lukewarm. Add proofed yeast and 1-1/2 cups of the flour. Cover and let rise in a warm place; approximately 1 hour. Add melted butter, sugar, salt, lemon zest, and egg yolks. Add remaining flour and knead until smooth on a lightly floured surface. Place in a greased bowl and grease the top of the dough. Cover and let rise until doubled in size. Roll out 1/2 inch thick and brush with the melted butter. 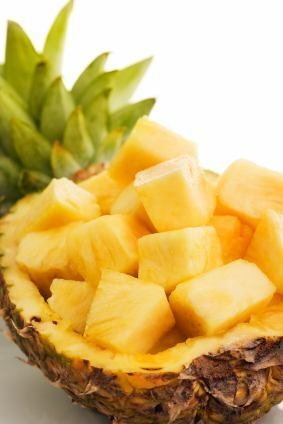 Sprinkle with sugar, cinnamon and then top with the grated pineapple. Prepare the pan glaze below. For the pan glaze, cream butter and sugar together. Spread mixture on the bottom of a well greased baking pan or muffin tins. Cover with grated pineapple. Place rolls, cut side down, on the pan glaze. Cover and let rise until doubled in size. Bake rolls for 25 minutes if baked in a 9x13 inch pan. Or bake for 15 minutes, if you used muffin tins.